Something beyond wonderful happened on Sunday afternoon. I never knew it was possible to be as happy about the birth of a baby that's not my own, but it is. On Sunday my sister became a Mum. And I became an Aunty! The most gorgeous little boy came in to the world and I couldn't be more excited. My nephew. This little boy, in his short time on this earth, has made so many people happy. None more so than his proud as punch parents. They've waited a long time to meet their precious gift and he's finally here. Safe and sound. All 9 pounds 5 and 57cms of him! Punky can't wait to meet her cousin. "My baby" she calls him. "My beautiful baby boy" were her exact words. She asked me if he was going to come and live with us and I think she was a little disappointed when I told her that he would be living with her Aunty and Uncle. Unfortunately the girls and Dave couldn't come with me when I met Bear for the first time last night. They are all sick and it wouldn't be right to expose his poor little immune system to their germs just yet. But soon enough they will get to meet their first cousin and nephew and I know they will love him as much as I do. 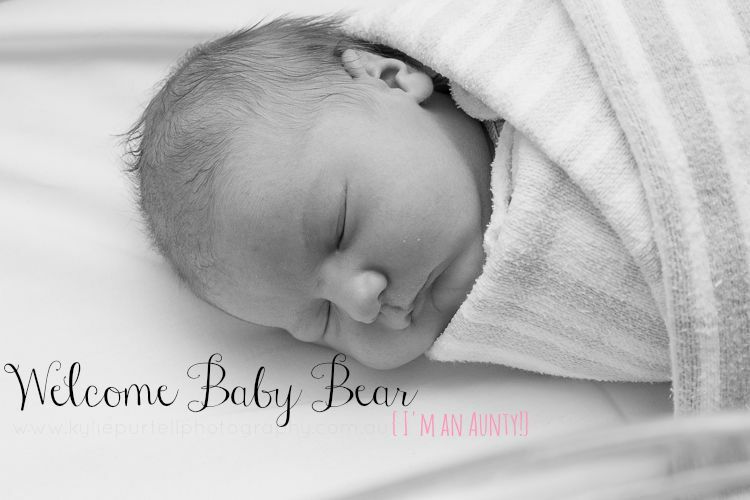 Welcome to the world my precious Baby Bear. I can't wait to be your favourite Aunty! Aunty Kylez sounds pretty good to me! Do you have nieces or nephews? Were you excited to become an Aunty?